U.S. nuclear power plant outages have been higher this summer (June through August), averaging 4.3 gigawatts (GW), or 51% more than in 2015. 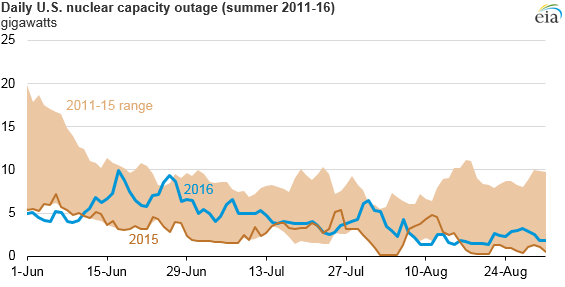 Summer outages were at their highest in June, reaching 9.9 GW, or about 10% of total U.S. nuclear capacity, on June 17 and averaging 6.2 GW for the month. Outages dropped to an average of 4.4 GW in July and 2.4 GW in August. Nuclear power plants, which provide baseload generation, account for nearly 20% of total U.S. electricity generation on an annual basis. Nuclear power plants provide power at a steady rate rather than in response to daily or hourly fluctuations in electricity demand. Nuclear outages typically arise from refueling and maintenance, power uprates, and unplanned shutdowns. EIA's Status of Nuclear Outages maps the generating capacity and outage status of each nuclear plant in the United States each day. Nuclear outages reached the lowest level since 2007 last year, when outages totaled just 0.1 GW during four days in August 2015. Nuclear power plants typically refuel every 18 to 24 months during fall or spring. Other noncritical maintenance work is often scheduled at the same time as refueling to minimize downtime. In the early 1990s, refueling-related outages lasted about 12 weeks. More recently, refueling outage durations have been reduced to fewer than six weeks. In spring 2016, refueling outages averaged 29 days. However, outages can last much longer when complicated maintenance is required. For instance, in May, two nuclear units, Indian Point 2 in lower New York and Salem 1 in southern New Jersey, entered outages that lasted for 100 and 101 days, respectively, to replace damaged reactor core baffle bolts. Indian Point 2 resumed electricity generation in mid-June, and Salem 1 resumed generation in July. In contrast, the Clinton Power Station, a boiling water reactor (BWR) in central Illinois, set a record in May for the shortest BWR refueling outage in the United States, at just 11 days.